'Access Combo' is yet another access control function that is included in the powerful data management application, TCMS V2. Use this feature to heighten protection at a specific door, whereby verification needs to be done by a combination of different users. This is specifically suitable for high-security rooms or vaults that requires more than one senior-level employees from different departments (i.e. : Head of HR, Head of Marketing, CFO) to be present for verification. Read below to see how to apply the settings. Download all users from the terminal to the TCMS V2 software. Assign the relevant users with access codes. The example below shows a scenario whereby any single person from two groups of users must verify with a person from the other group to gain access. In this case, Users 1, 2 & 3 can only gain access if they verify together with either User 4, 5 or 6. To apply the changes, update the access codes to the terminal as per the picture below. Assign the users' access codes into two different TZ Group but one same Group TZ as per the picture below. This must be done because the access combo will only work when the time zone range of both groups are the same. Update the changes to the terminal. You only need to update these changes to the terminal once, unless changes are done to the time zone settings. Configure the access combo manually into the terminal by clicking Menu > Option > Access Option > Access Combo > Fill in these details: Comb 1 = 12, Comb 2 = 12. Please take note that the access combo setting can only be done from the terminal. The access combo setting will automatically change back to default if update is done from terminal employee control, and you will need to reconfigure the settings. 1. 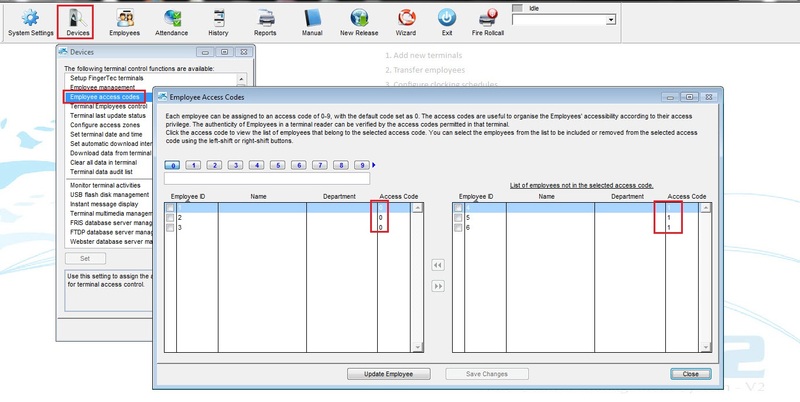 Download the user from terminal to TCMS V2 at Devices > Employee Management > Download User. 2. Assign the new user with an existing access code i.e. : Assign new User ID 7 with Access Code 1.
voila! After configuration and update, User ID 1, 2 & 3 must now do verification with any one of User ID 4, 5, 6 & 7 to gain access.